This most excellent postcard, a reprint of an old rodeo-type poster, came to me from my favorite sendsomething user in Wyoming. 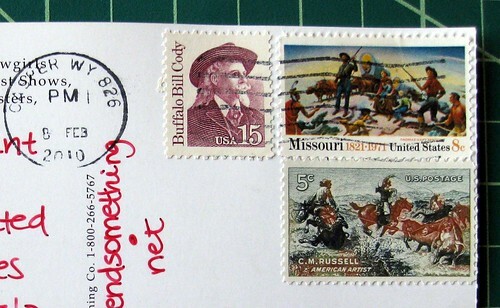 She even kept the stamps all-cowboy: traces of Buffalo Bill Cody on both sides. Yee-haw! Oh! wow! I love the wild west postcard you received! Anyone know where one can buy a postcard like that one on-line? 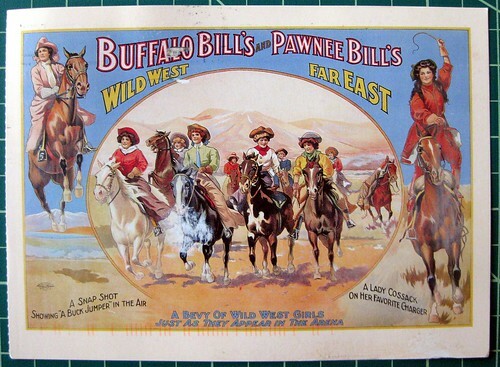 It is so hard to find postcards like that even where I live in the wild west. ......and I love the stamps that were added to the theme!